Crystal Waters slot machine from Real Time Gaming is a 5 reel machine with 20 playable lines. The setting of this slot machine is the tropical beach and azure blue waters. This slot lets your mind wonder off from the cold and grey winter blues to the hot and warm Caribbean paradise. 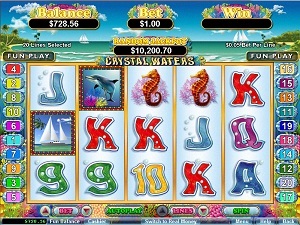 Crystal Waters offer the players a great looking slot, filled with bonus features and cool extras. The symbols that are used on the reels enhance the beach feeling and you will see a lot of sea turtles, angel fish and many more of the coral creatures. Crystal Waters slot machine from Real Time Gaming is a very nice escape from the grey everyday life and it makes you want to win big so it can become your reality! The main colouring of this slot machine is taken from the amazing beach scenery of the tropics; blue, green and all other colours that you can see in the coral reefs. The symbols are all very detailed in their design. There is no background music in the main game, only the sound of the slot arm being pulled. In certain wins a music score will be added and this is a very efficient way to increase the level of excitement. As mentioned before, the tropical sea theme is very evident in the symbols. You will see a lot of symbols from the tropical coral reefs; angel fish, sea turtles, shells and sea horses. The wild is the dolphin symbol and it will substitute for all other symbols except for the scatter. The prize is doubled when two or more wilds substitutes in a winning combination. The scatter is the Yacht and if you hit three or more of the scatter you will activate the bonus feature. The lower paying symbols are the card deck symbols 10, J, Q, K and A. Once you hit three or more scatters, you will activate the bonus feature. The bonus feature consist of 15 free games where the bonus fish multiply your winnings by 2, 4 or 8 if it substitute for a winning line. The bonus fish only appears on reel 3. The bonus feature can be re-triggered while playing the feature. Crystal Waters has 5 reels and 20 lines to bet on. You can easily configure your betting preference if you click on the Line button in the lower part of the game window. The minimum bet per line is $0.01 and the maximum is $5. Crystal Waters also has an auto play function which is very easy to use.